Are you dreaming of eating freshly baked bread in the morning for breakfast? Or maybe you are just tired of the cold preservatives-packed store bought bread? Either way, we know what you need – a high-quality bread machine! It will not only satisfy your needs, but it will also exceed your highest expectations. You will just need to add the necessary ingredients in the machine and press the button – this magic appliance mixes, kneads and bakes perfect bread loaves for you. Yet, the challenge here is to choose the right bread machine – the one that will suit your needs and deliver delicious bread. In order to find a good bread maker, you will need to spend some time on research. If you are not ready for this type of commitment, we understand you. It might be frustrating to waste your precious time scrolling through numerous articles and posts. Don’t worry – you can consider yourself lucky – we have created this short review to ease your choosing process. Today, we will discuss the key highlights of the Breadman TR2500BC Ultimate Plus 2-Pound Convection Breadmaker. Having all the baking options you can imagine, this outstanding bread maker is one of the most popular on the market. 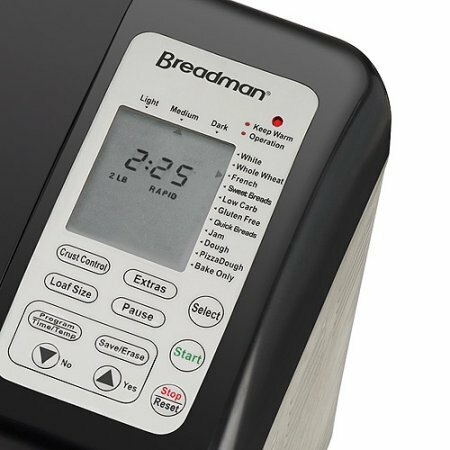 The Breadman TR2500BC Ultimate Plus 2-Pound Convection Breadmaker offers 16 pre-programmed baking options – including all the basic settings (basic, whole wheat, gluten free, crusty loaf, sweet, yeast free, dough) plus the extra options - like low-carb, gluten-free and Rapid Bake. The Breadman TR2500BC Ultimate Plus 2-Pound Convection Breadmaker has the automatic fruit and nut dispenser for the convenient addition of the necessary ingredients – you don’t need to wait for the signal, the machine adds the desired components automatically. 3 loaf sizes – 1, 1.5 & 2 lb. This outstanding bread machine was created for those, who love to experiment and be creative while cooking - Breadman TR2500BC Ultimate Plus 2-Pound Convection Breadmaker provides with numerous unique features that can be further customized as per your own preferences. The Breadman offers you the ability to design the bread making experience as per your taste thanks to its built-in feature to customize times in any baking function. The Save Your Faves Breadman function provides you with an opportunity to preprogram 5 personal recipes. Besides, Breadman TR2500BC Ultimate Plus 2-Pound Convection Breadmaker offers such useful options as 24-hour delay bake timer, power failure protection system and 10-minute pause control to improve your bread making experience. This bread machine can bake loaves in three different sizes – 1, 1.5 & 2 lb. Plus, you can make your bread with light, medium or dark crust. The model has a large viewing window, so it easy to monitor the process of baking! This bread machine is an excellent and irreplaceable helper in the kitchen – its sturdy construction ensures the longevity of the device. The bread machine comes with the recipe book that explains various methods of using the appliance in detail. In addition, the item comes with the special measuring cup and spoon, so you don’t need to guess whether you put the right amount of ingredients in the mixture. One of our go-to rules is to read the customer reviews about the product before buying it online. We followed this rule with Breadman TR2500BC Ultimate Plus 2-Pound Convection Breadmaker, too. After reading through a number of positive reviews, we are ready to confirm that this Breadman Bread Maker is one of the most reliable bread machine models on the market. 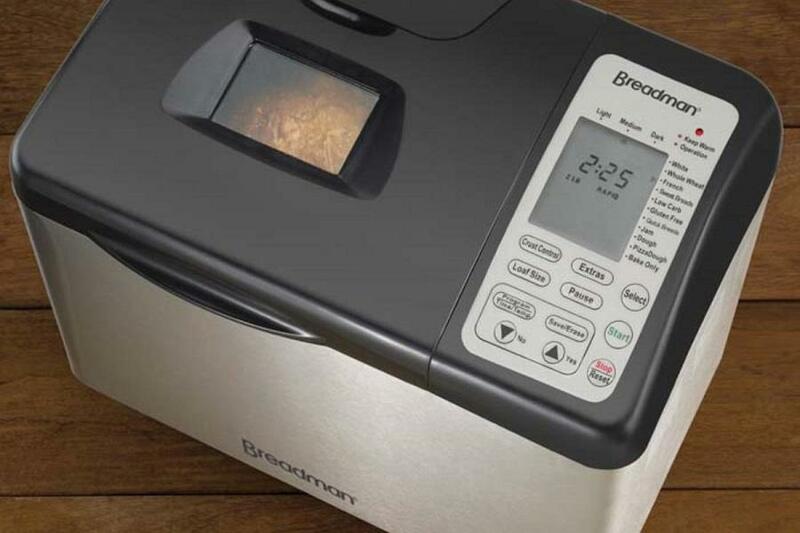 Owners of Breadman TR2500BC Ultimate Plus 2-Pound Convection Breadmaker stated that the crust option of the bread machine is flawless – it bakes the bread for just the right amount of time. People also highlighted the automatic fruit and nut dispenser usefulness – you don’t have to wait around the bread maker to add the needed ingredients, the machine does it for you at the right moment. Some reviews stated that the Breadman TR2500BC Ultimate Plus 2-Pound Convection Breadmaker is capable of producing wonderful bakery quality bread. In addition to the above-mentioned advantages, this bread maker is easy to use even for newbies, according to the reviews. The great nonstick bread pan and paddle appeared as another favored feature. In case you want to purchase this Breadman TR2500BC Ultimate Plus 2-Pound Convection Breadmaker, you will need to know some additional information in advance. Breadman Company provides limited 2-year warranty for this bread maker. After scrolling through a dozen of appealing deals on the Internet, we have decided to stop our search at Amazon. 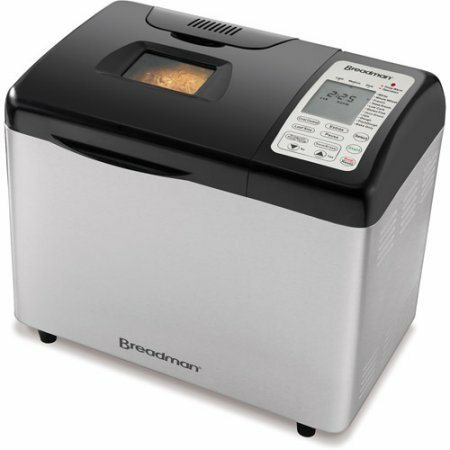 Currently, Amazon is offering this Breadman TR2500BC Ultimate Plus 2-Pound Convection Breadmaker for around $300 with free shipping. 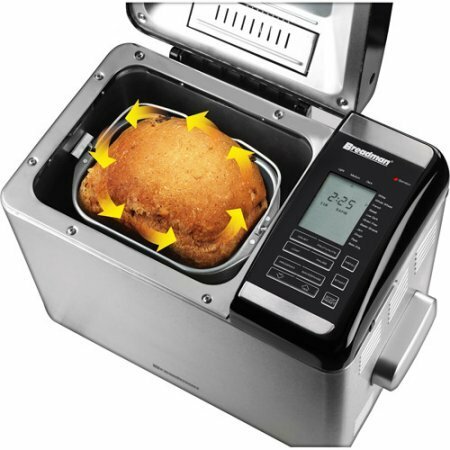 Breadman TR2500BC Ultimate Plus 2-Pound Convection Breadmaker is exactly what you need! The model stands out among other reliable bread machines available on the market, thanks to its highly customizable features. If you want to save money in the long term and eat healthier food – we highly recommend purchasing this great Breadman Bread Machine.